Easy to make and easy on the waistline. Thin, organic, pizza’s are all the rage right now. Clever ingredients like organic fennel, farm raised and hand-made pork sausage, imported olive oil and goat cheese are appearing on trendy (expensive) menus all over Phoenix !! 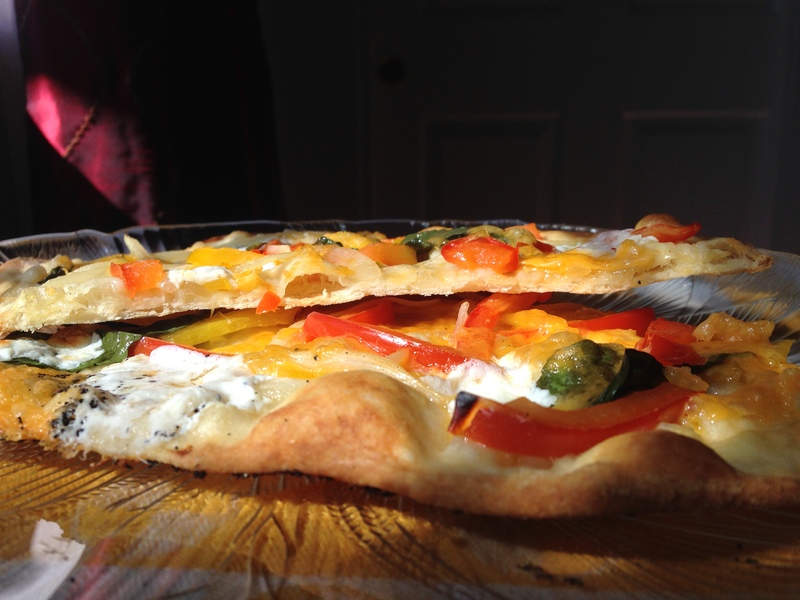 Well, if you want to spend less than $2.00 for a homemade, thin & trendy pizza – then you’ll love how easy this recipe is. Warning: Making dough and pizza is addicting!!! Kneading, rising and then baking them into bubbly crispy goodness is a satisfying experience. 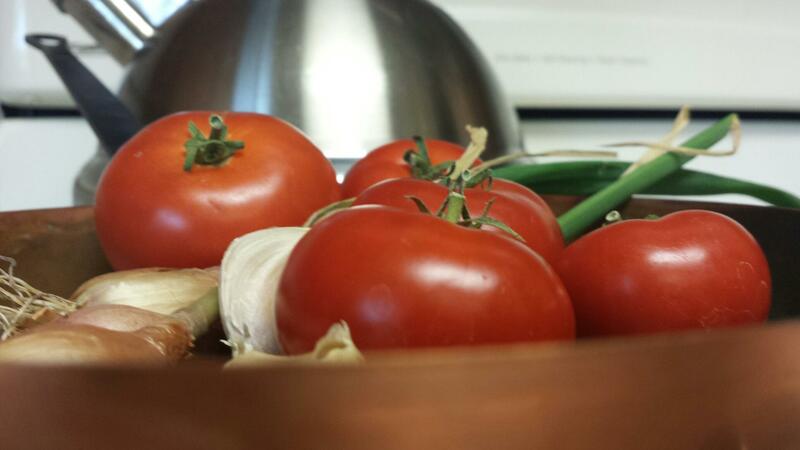 My husband, Tom, is my personal test-kitchen assistant. He’s always ready to try one. I have quite a few “before” pictures, but “after” pictures are rare because we eat the little gems right when they’re done. I use a stand mixer with a dough hook. The hand method in a large bowl or mixing directly on the counter works too. I use room-temp ingredients. Combine warm water, yeast, and ½ cup of bread flour into mixing the bowl and whisk. Let it rest for 10-15 minutes so the yeast gets moving and is easier to blend into the remaining flour. Add a few more cups of flour, olive oil and salt. Blend. Add enough flour so that you can knead the dough. The dough is usually sticky, so put a little olive oil on your hands and pull the dough from the bowl onto floured board. Knead gently for about 5 minutes and form into one long french-bread size loaf. Let it rise for about 20 minutes, on the counter, with a light towel over it. I live in Arizona, so my kitchen is usually warm and draft free. Adjust your environment if you need to. 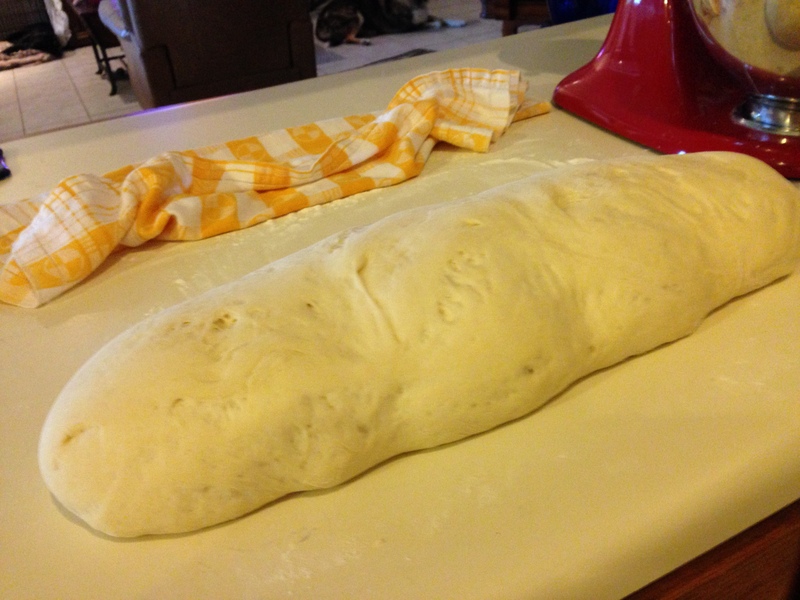 After the dough rises, knead the air out gently and re-form into long loaf. The goal here is to cut the loaf into personal size pizzas. At this stage, I get out a box of small sandwich baggies. Then cut the dough into even pieces. Tip: cut the dough in half, then cut each half in half – repeat until the dough is cut into about 12 pieces. 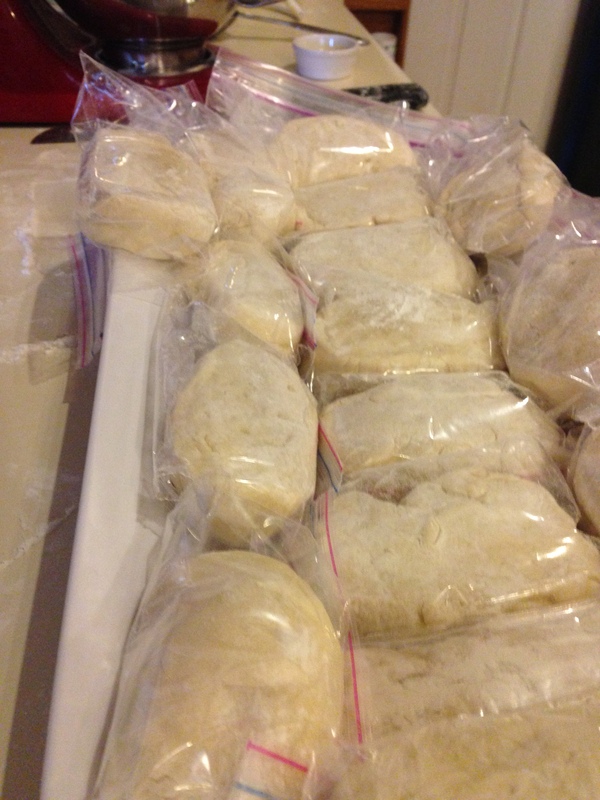 Put them into the baggies and refrigerate for at least 4 hours. Tip: sprinkle the counter and your hands with flour to help get them up and into the bags. You’ve just created homemade personal size pizza dough and can use them for the following week. Throw a pizza party!! 1. Preheat your oven and pizza stone to 535 for about 10 minutes. 2. No stone? Use whatever metal pan you have to fit your pizza size. Preheat oven only. 3. Sprinkle pizza or cutting board with a small amount of cornmeal. Or whatever pan you use. 4. 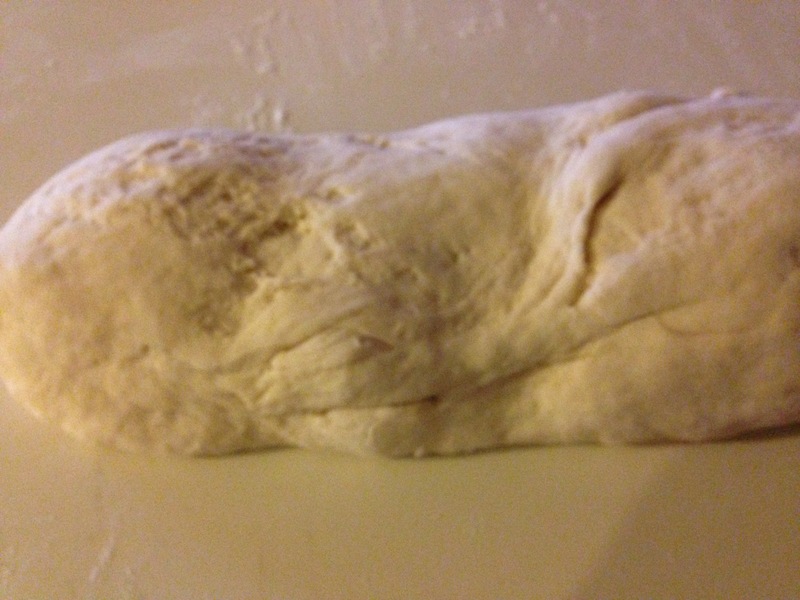 Knead cold dough onto floured surface and roll paper-thin. Roll from the center out to edges. 5. Transfer the dough onto the cornmeal board or pan. A large spatula is handy for this. The cornmeal board is most important IF USING a stone, as you use the board to slide the dough into a very-very hot oven AND then retrieve it back off the stone 4-6 minutes later. Use the large spatula to coax the dough off/on the board. 6. If using a cookie sheet or different pan, sliding it in and our is not necessary. • They cook very fast. Turn your oven light on and watch the magic happen. You’ll want to stay on “burn patrol” and pull the pizza out when the cheese bubbles and the edges just start browning. • Most pizzas take 3-7 minutes to bake depending on how thin your roll and how much is on it. • First brush dough edges with olive oil, specialty oils really punch up the flavor. I use a Tuscan blend. • Spread about 3 Tb. of pizza sauce OR make a white pizza and drizzle all the dough with just olive oil. • Mince or slice ingredients as thin as possible. 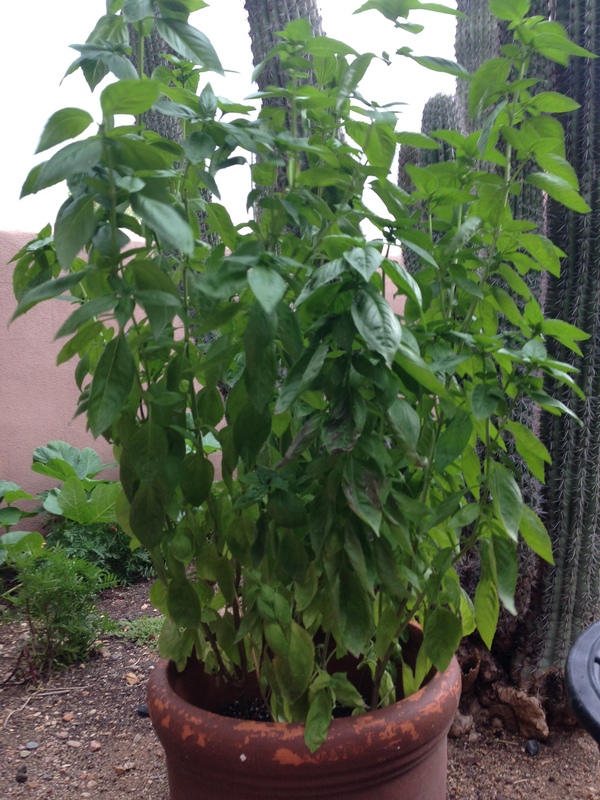 • Cover basil or any fresh leaf with a little bit of cheese or olive oil so they won’t burn. • Have fun with whatever you like! Olive oil, fresh swiss chard, basil leaf (roll and thin slice/chiffonade), sharp cheddar and/or mozzarella cheese works as a go-to base for the addition of meats and veggies. 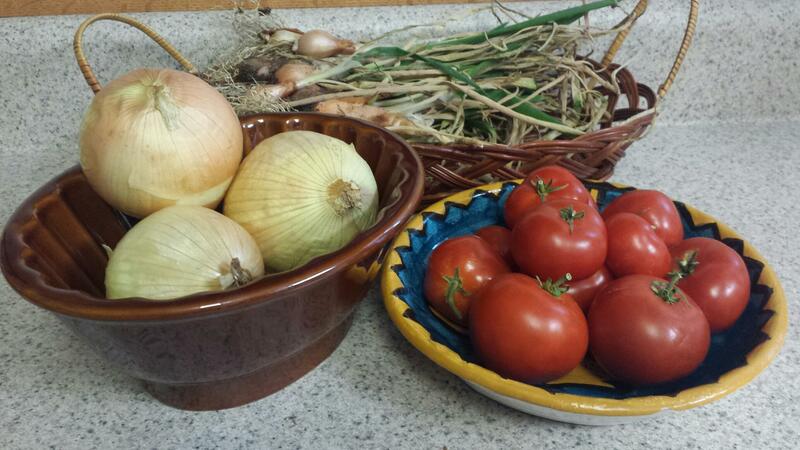 The trio can be made with pizza sauce or plain olive oil. So far, I’ve used BBQ meatballs, spicy Asian meat loaf pieces, spinach & Asiago chicken sausage, red & yellow peppers, white & red onion. Next I’ll try the chuck roast I made for dinner last night. 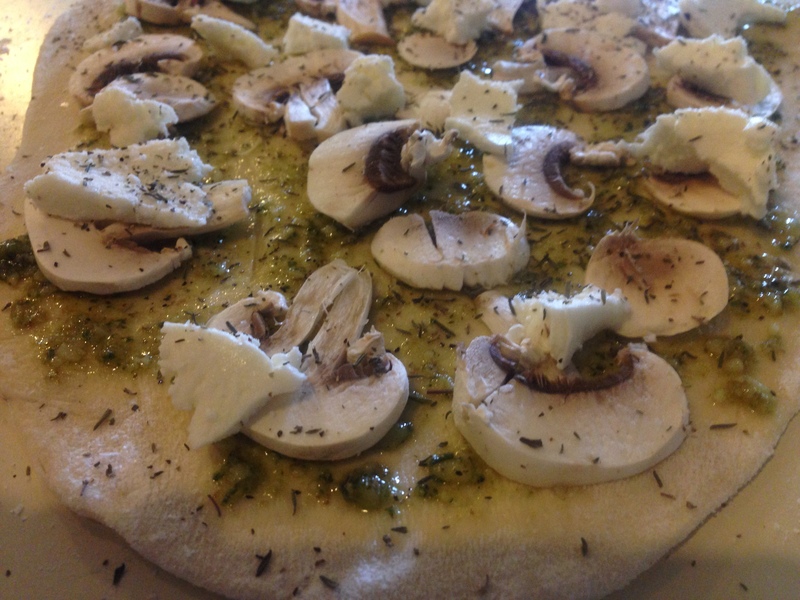 * Walnut and basil pesto, sliced white mushroom, mozzarella, sea salt, black pepper, dried thyme. * Olive oil, fresh whole basil leaf, mozzarella cheese, sea salt, black pepper, dried oregano. 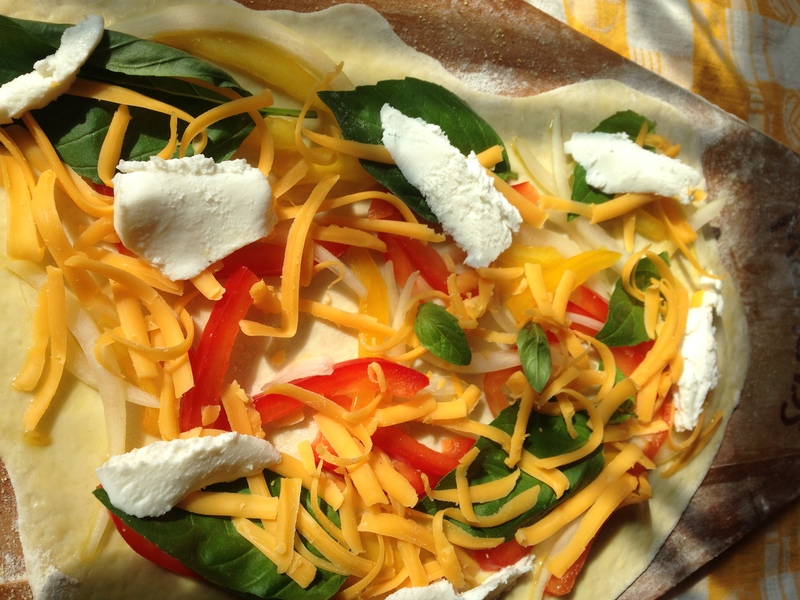 * Olive oil, red & yellow peppers, white onion, fresh basil leaf, cheddar cheese and dried oregano. Go ahead! Make your own. You’ll never want to eat frozen or take out pizza again. yummy…yummy…yummy. The recipe looks easy enough even I can do it. I just want to grab a piece right out of the computer and devour . I will definitely make this. Post a before and after photo of what you make! I’d love to see the combination you choose. We had a blast making these pizzas and they’re delicious! I was inspired after having so much fun with them. It’s marvelous to watch them bake up beautifully and pizza just seems to transform people into good moods! I used the dough to make Italian rosemary & Parmesan flat bread for a Halloween party that Tom and I went to. It was an instant hit and so quick and easy. So many good options for organic toppings at John’s Amish Country, Shitake mushrooms, peppers, variety of onions, garlic and fresh herbs! We make pizza often but we recently used 00 type flour from Italy that you can find at most grocery stores these days and also Italian delis or on line. The crust was thin, crispy and silky. 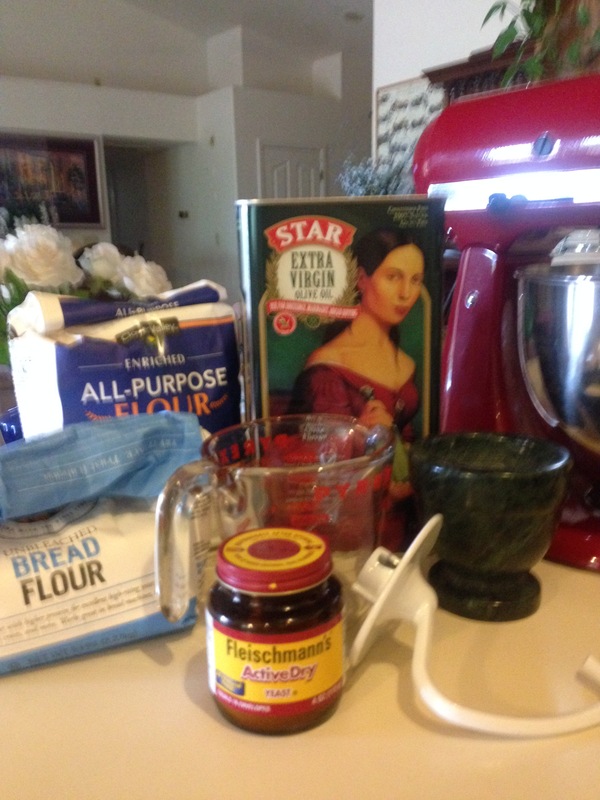 We may experiment with other flours like Eikhorn or cassava soon to be more gluten free. Also, I have found that Arrowhead Mills organic yellow cornmeal works best on the pan under the crust for air circulation as it is very finely ground. Other brands of cornmeal are too coarse and crunchy. Beware of other cornmeal brands that may be GMO. We love Shreiners sausages and pepperoni. Many local pizza restaurants use their sausages. Wow!! I love all the excellent information you shared. Thank you. Obviously you are a pizza enthusiast. A finer cornmeal is a good idea. I noticed that the large grains are not so pleasant on the pallet. Yes, we could eat pizza every day! I love sharing products we use that are the best! I agree the finer organic cornmeal is much better. Bob’s Red Mill brand was much too coarse and didn’t work with a thin crust. Also I misspelled the sausage maker’s name. It is Schreiner’s in Phoenix.